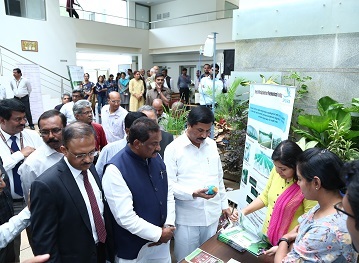 (L-R) ) Prof Satyajit Mayor, Board Member, C-CAMP, Director, NCBS and InStem; Dr Taslimarif Saiyed, CEO and Director, C-CAMP; Mr N H Shivashankara Reddy, Minister of Agriculture; Mr K J George, Minister of Large & Medium Scale Industries, Information Technology, Biotechnology and Science & Technology, Government of Karnataka. 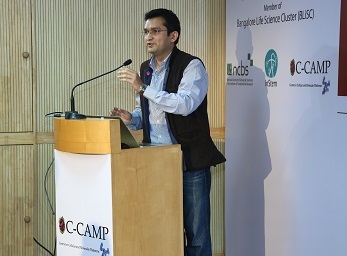 Bengaluru: The Centre for Cellular and Molecular Platforms (C-CAMP), India’s premier biosciences innovation hub, has initiated three major innovation programmes for startups spanning the whole gamut of life sciences, biotech and agriculture. These programmes namely, Karnataka Startup Advancement Program (K-SAP) BIO 50, K-Tech Agri-Innovation Centre and K-Tech Technology Business Incubator have been supported by the Government of Karnataka. These were formally inaugurated on 2nd July by Mr K J George, Minister of Large & Medium Scale Industries, IT, BT & ST, Government of Karnataka and Mr N H Shivashankara Reddy, Minister of Agriculture, Govt. of Karnataka. 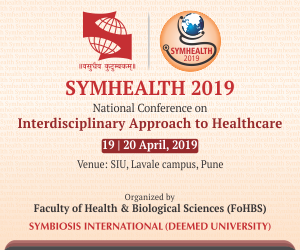 The programmes are mandated to provide incubation, mentorship, knowledge-sharing and handholding support to startups at various stages of growth and ensure that their deep-science innovations in the field of life sciences including in agriculture, reach the market. The Karnataka Startup Advancement Program (K-SAP) BIO 50 is a comprehensive programme initiated by the Centre for Cellular and Molecular Platforms (C-CAMP) in association with Bangalore Bioinnovation Centre (BBC) to provide necessary impetus to Karnataka startups working in any discipline of life sciences early on in their entrepreneurial journey by identifying gaps and providing the required mentorship, knowledge and network in a structured format. “The future is for new enterprises. Entrepreneurs of today are solving current problems and managing to thrive in a difficult but large market. CCAMP as an institution has been instrumental in supporting such initiatives. “ said Mr Gaurav Gupta, Principal Secretary, Department of Information Technology, Biotechnology and Science & Technology, Government of Karnataka. Based out of University of Agricultural Sciences (UAS-B), GKVK Campus C-CAMP has supported over 100 innovative Life Science start-ups from all different sectors of biotechnology and life sciences. However, a critical gap has been identified in the agricultural domain which has not witnessed the same surge of innovations as in healthcare. The K-Tech Agri-Innovation Centre at C-CAMP will attempt to change this by promoting deep-science/technology driven entrepreneurship in the agri-sector, leading to innovation, economic development and job creation in the agricultural domain. The Centre is envisioned to identify specific agri-health issues through an immersion programme, bring innovators together to develop solutions for these issues and subsequently support and nurture them to bring their solutions to the market. Using this multi-step process, C-CAMP aims to identify and support at least 8-10 path-breaking innovations with national impact in the agriculture field and facilitate the validation and deployment of these innovations. With recent support from the Govt. 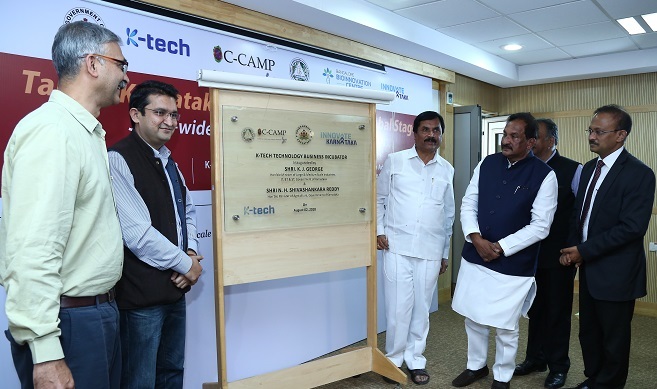 of Karnataka C-CAMP has collaborated with UAS – B, GKVK to identify a space in UAS-B to set up the K-Tech Technology Business Incubator for scaling up its efforts in nurturing innovative life science and biotech start-ups through incubation. Prof Satyajit Mayor, Board Member, C-CAMP, Director, NCBS and InStem thanked the Govt. of Karnataka for their continued support towards CCAMP initiatives and lauded CCAMP’s role in nurturing the startup ecosystem in the state. C-CAMP with its vast experience in supporting start-ups plans to leverage its existing collaborations in the Bangalore Life Science Cluster with NCBS and InStem to continue and scale-up its efforts in promoting innovation and entrepreneurship at UAS-B, GKVK through this newly established bio-incubation facility and extend its scope to include more innovative life science, biotech and agriculture-based start-ups.